Our last day in Rome together there was an incredible transportation strike and let’s just say, it couldn’t have worked more to our advantage. Our professor was incredibly upset, trying to figure out how to get us to the other side of Rome and back for our day’s activities. So, we decided to get up early and hoof it and it turned out to be a beautiful day with us seeing several things we may otherwise not have. 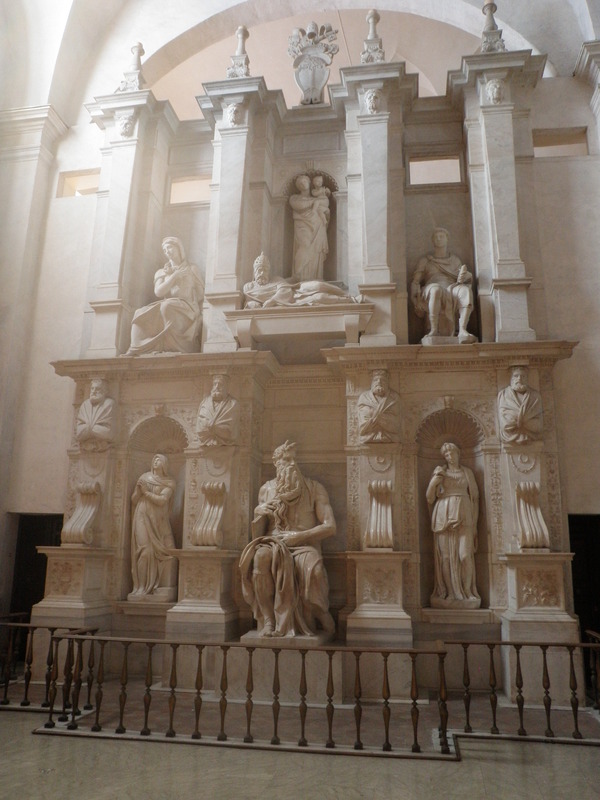 The main stop was to be ICCROM (International Centre for the Study of the Preservation & Restoration of Cultural Property) but as we were walking there it just so happened we passed S. Pietro in Vincoli, the location of Michelangelo’s Moses. 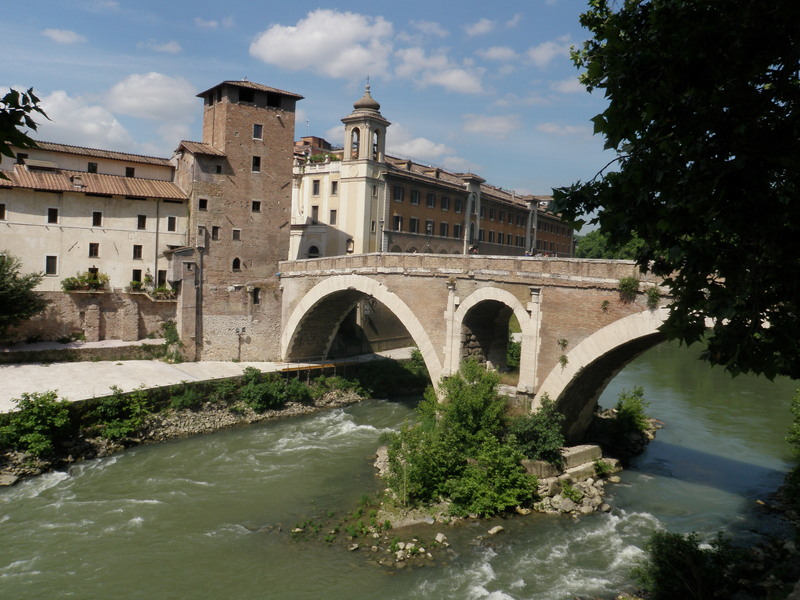 We also enjoyed the beautiful views of Isola Tiburtina (Tiber Island), and all because of the strike! ICCROM was founded in 1956 by UNESCO and is an intergovernmental organization dedicated to the conservation of cultural heritage. We had the joy of hearing two employees speak, Paul Arenson, Manager, Knowledge and Communication Services, and Alison Heritage, Conservation Research Specialist. ICCROM is a very interesting place and has an amazing research library. It’s definitely a resource I’m going to keep in mind for the future. 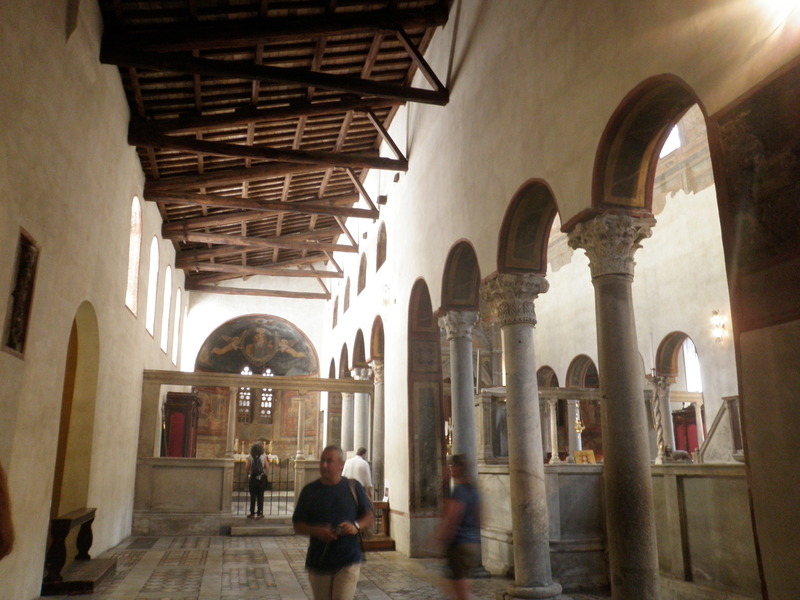 We also visited two more churches (LOTS of churches in Rome). The first was Santa Cecilia in Trastevere, a 5th century church in Rome, Italy, devoted to the Martyrdom of Saint Cecilia. 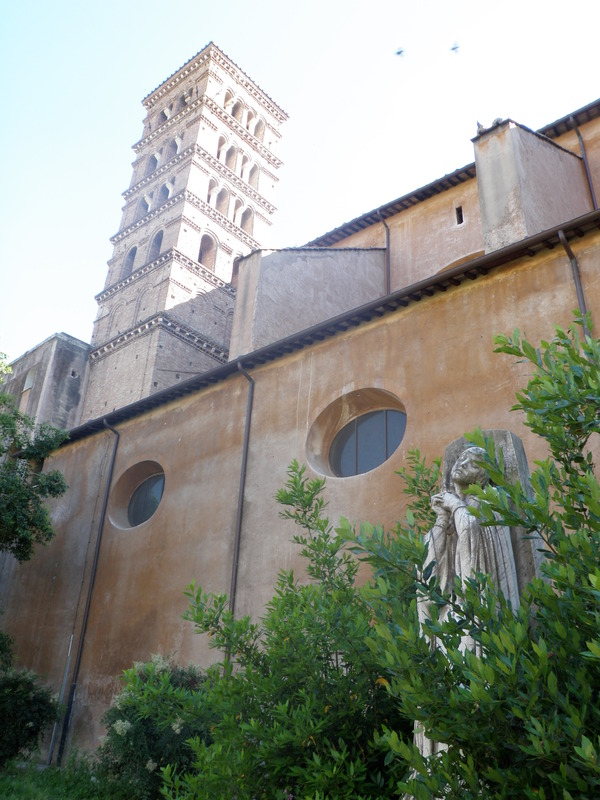 The second was the Basilica of Saint Mary in Cosmedin, an 8th century church where the Bocca della Verita or the Mouth of Truth is located. Visually, this may have been my favorite church in Rome, simply because of its LACK in overwhelming shiny decor. 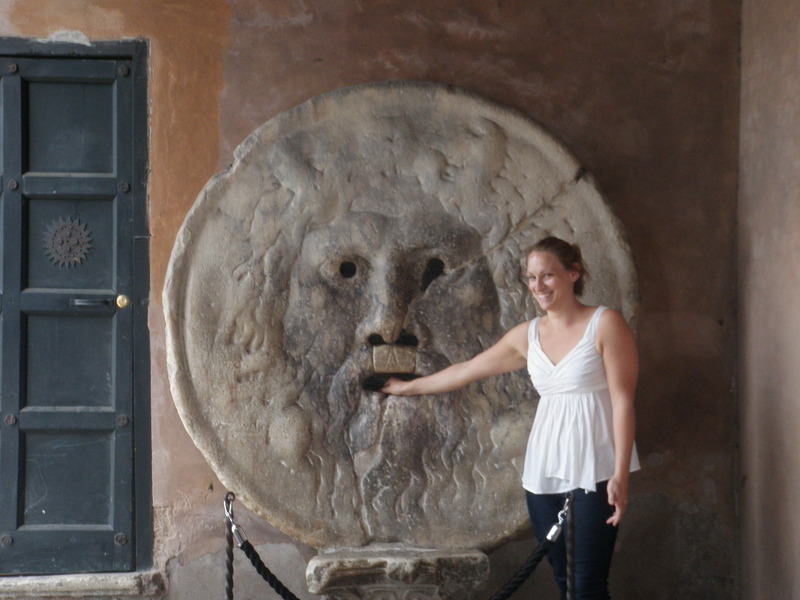 The Mouth of Truth sculpture is thought to be part of a 1st century fountain and it is famed as a lie detector. 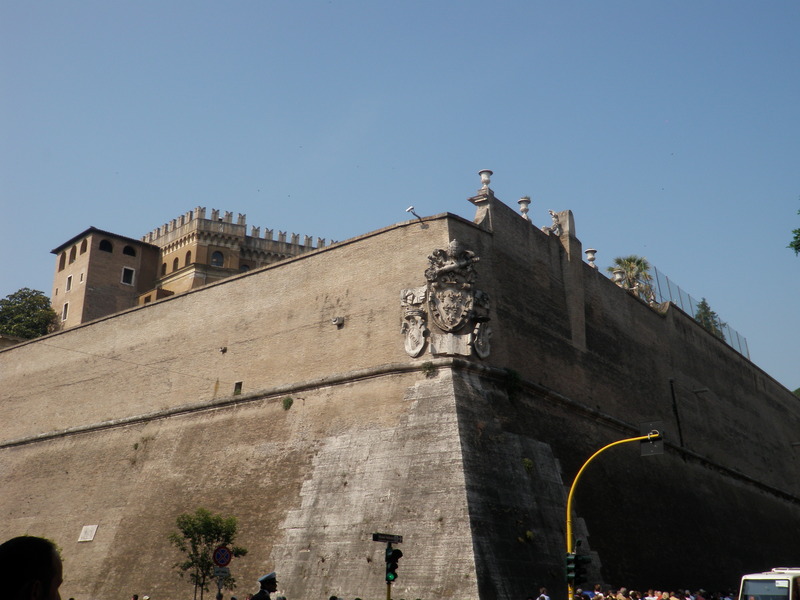 Though it was really made famous by the movie Roman Holiday, it has been believed that since the middle ages that if one told a lie with one’s hand in the mouth, then it would be bitten off. Rest assured friends, I still have my hand. I only speak the truth! This was a truly amazing and wonderful trip and I hope you have all enjoyed taking it with me via my blog (albeit a much LONGER blog trip then I had intended). One cannot do Rome in eight days, but if I had to, I couldn’t have asked for better or more efficient guides than I had in Charlotte and her husband, Derek. I learned an incredibly amount and saw more amazing things than I can even mention. Sunday was my sort of day in Rome, the weather was amazing and we visited incredibly interesting places…I’m going to leave out the fact that I did get pooped on by a bird while standing in a lovely orange grove atop a hill. We began our day in one of the most depressing ways possible at the Museo Storico della Liberzione di Roma or the Historic Museum of the Liberation of Rome. 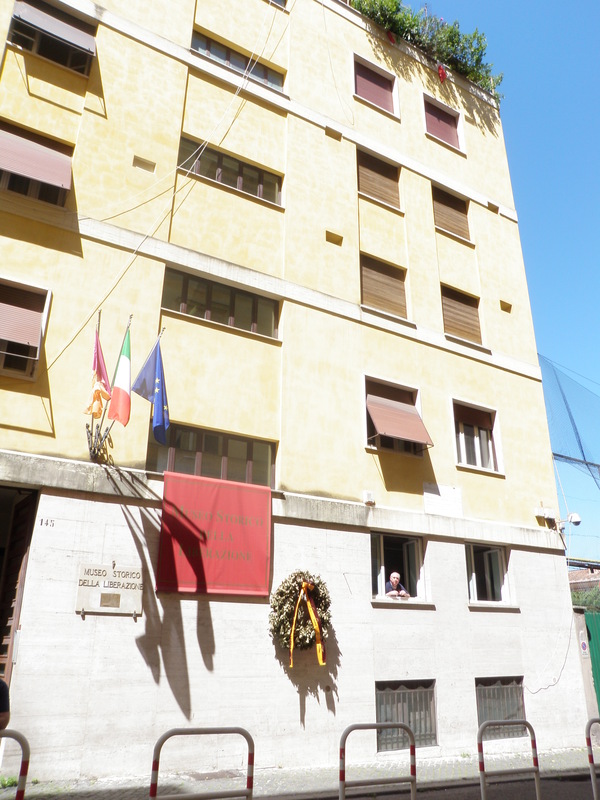 During the Nazi occupation of Rome, approximately September 1943 through June 1944,this building was used as a detention prison by the Command of the Security Police. A couple of the cells remain as was within the museum, with names and painful inscriptions carved into the walls of the cells by those detained there without light and little ventilation. Several of the prisoners that were held here by the Nazis eventually met their demise during the massacre of the Fosse Ardeatine, when ten Roman or Jewish prisoners were chosen to die in order to compensate for each single German that had been killed, totaling 335 people. Though we did have limited packets of information in English, all of the exhibitions were in Italian, making it difficult to read the entire story. 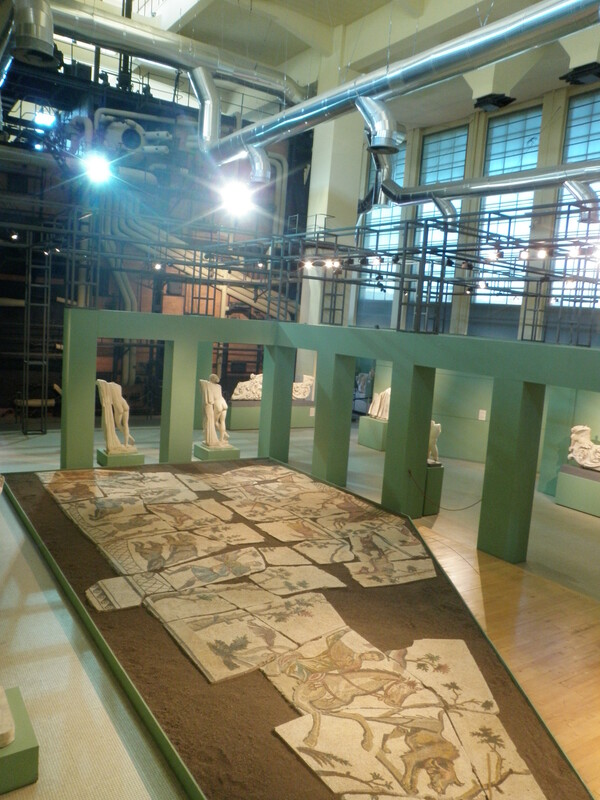 Next on to the Centrale Montemartini. I found this Museum to be absolutely fascinating because of the history of the institution itself. 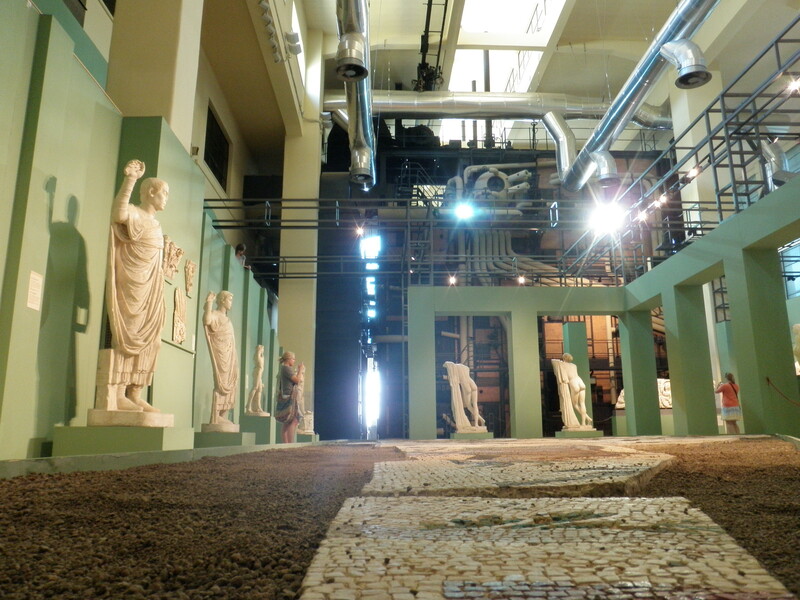 The Museum is housed in what used to be the first public thermoelectric center in Rome (electricity plant). 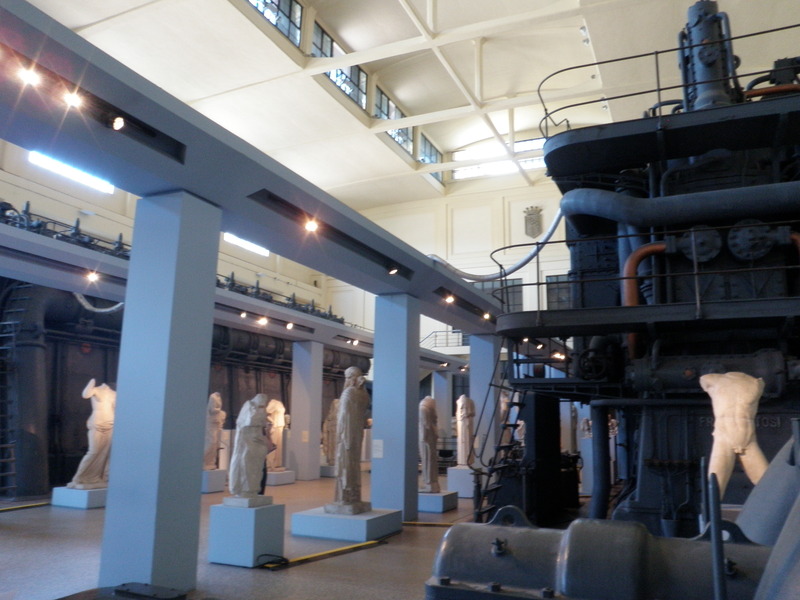 Much of the hulking equipment and industrial machinery are still present in the building, which for a time had merely become offsite storage for the Capitoline Museums antiquity overflow. 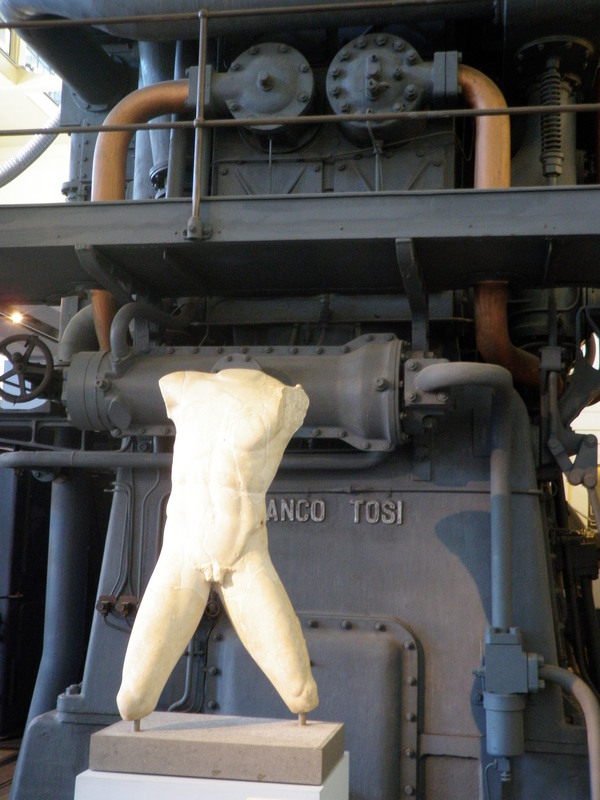 In 1997 a structured exhibition was created in order to maintain accessibility by the public to these works of art, it was called “The Machines and the Gods”, which placed side by side classical art and industrial machinery. I feel this is truly one excellent example of adaptive reuse and a perfect dichotomy of new existing with old. I especially enjoyed the use of soothing blues and greens for wall/accent colors as it helped to make peace of the transition between the harsh gray machines and the smooth tans and whites of many of the artifacts. As far as our structured portion of the day, it was fairly short. So far the rest of the afternoon Luciana and I headed out to Aventine Hill (another of the Roman hills) and it was absolutely lovely. It was a peaceful afternoon of walking, sitting in the orange and lemon groves, looking at beautiful churches with more beautiful views, rose gardens and the absolute BEST view of all of Rome (or so I think). Santi Bonifacio e Alessio, gorgeous! 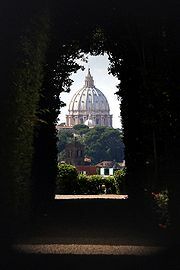 On Aventine Hill there is a keyhole in a door to a garden. 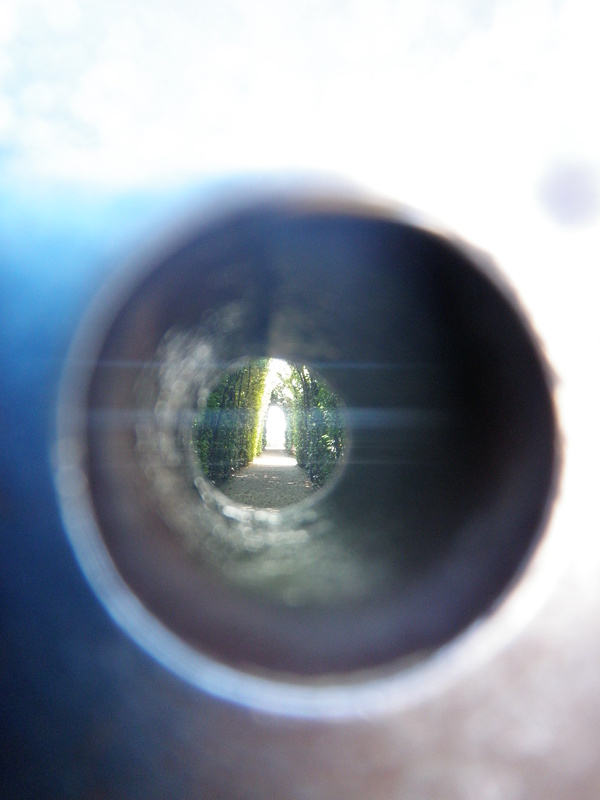 If one looks through the keyhole you see down a shrub lined path with a sunlit opening at the very end. 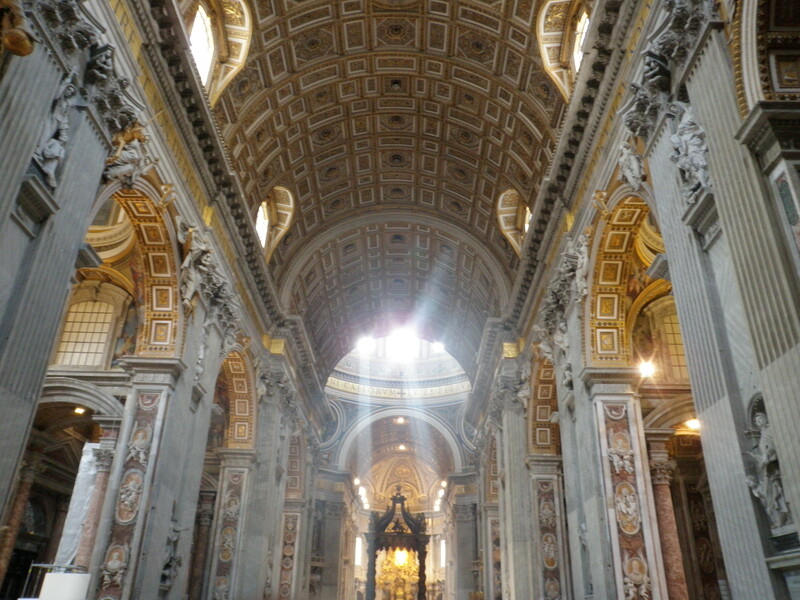 Through this opening at the end you see a perfectly framed view of St. Peter’s. Now I thought this might be a little hokey but after seeing it I think I would definitely put it on the list of things one must do in Rome. It is unfortunately hard to take a picture of this glorious view, especially with my brick of a camera so I’ll have to cite somebody else here. 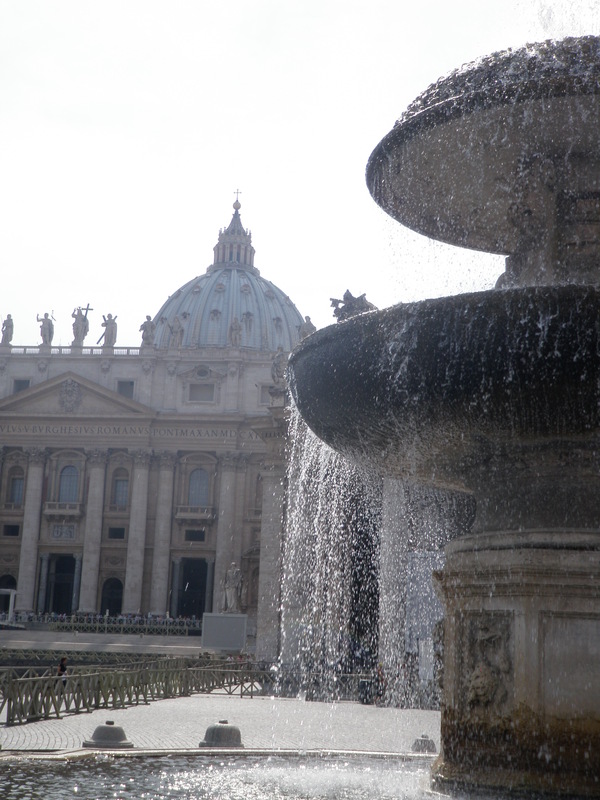 Alas, another wonderful day in Rome. What my camera saw at Piazza dei Cavalieri di Malta. The Galleria Borghese (built 1613-16), what a beautiful place to begin the day, a wistful mansion retreat built almost exclusively to house hundreds of Italian Masterpieces, not necessarily to live in. We met first with Maria Assunta Sorrentino, Exhibitions Coordinator and Register, along with some of her colleagues. 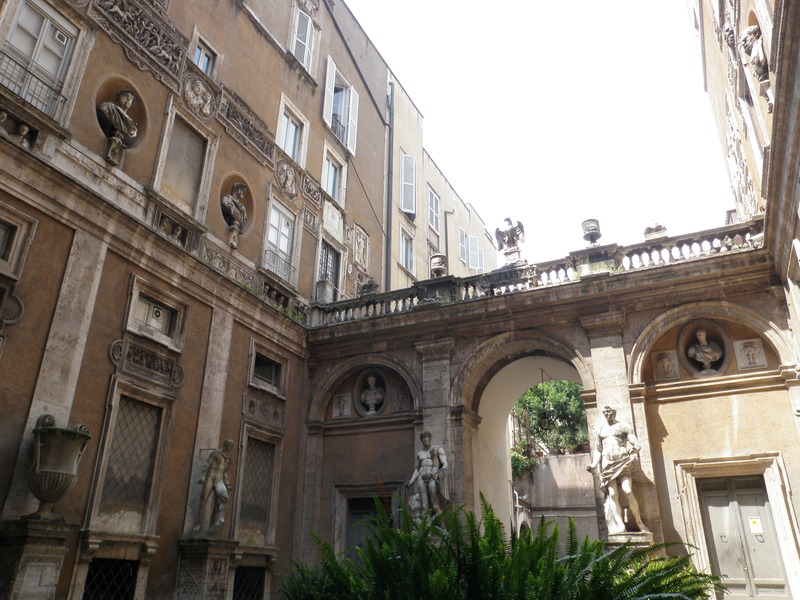 The speakers explained how Borghese is one of 3,000 some federal museums in Rome. 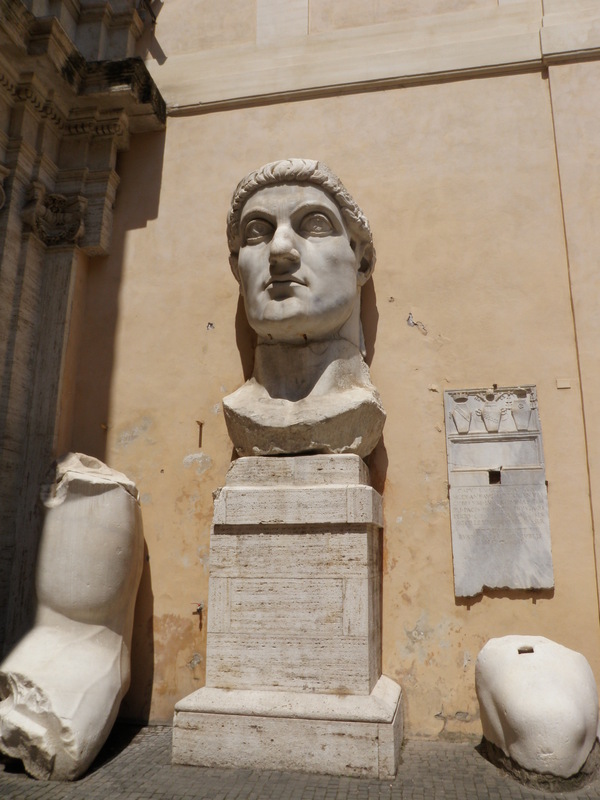 Most any cultural institution in Rome is run by the government in some capacity, greatly influencing funding and their abilities to collaborate with other museums or institutions. Though the collection here is massive a large portion of the original collection survives in Paris. 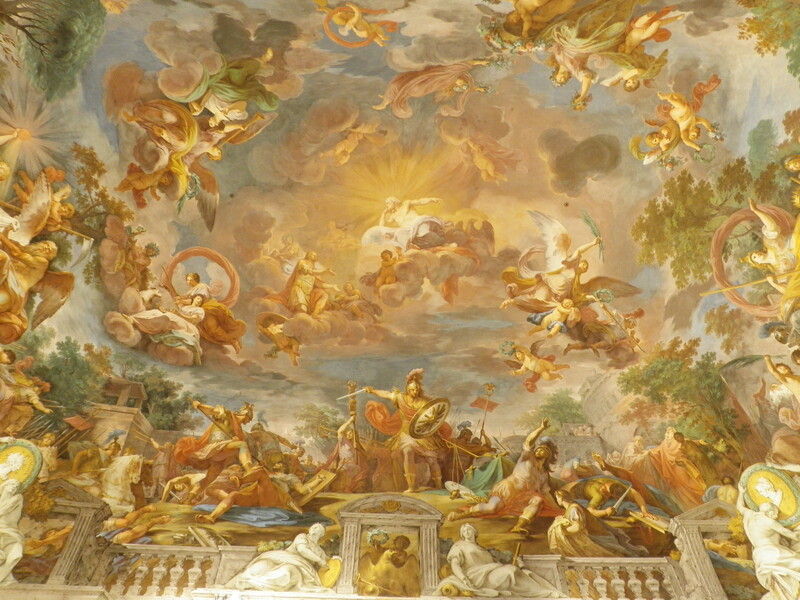 One of the Borghese sisters married Napoleon Bonaparte and during his raging plunder of European high culture and arts, the Galleria Borghese was not spared. 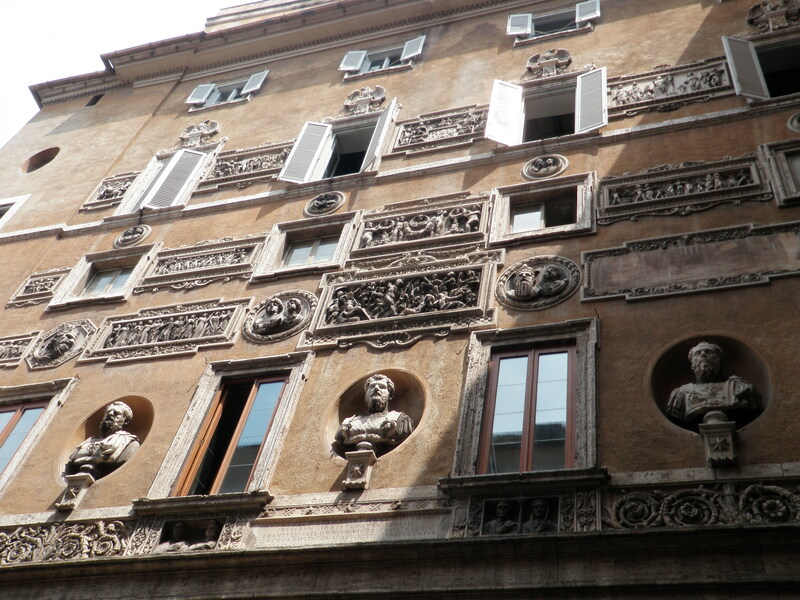 However, because of his relationship to the sister, the Borghese art was “sold” not stolen. 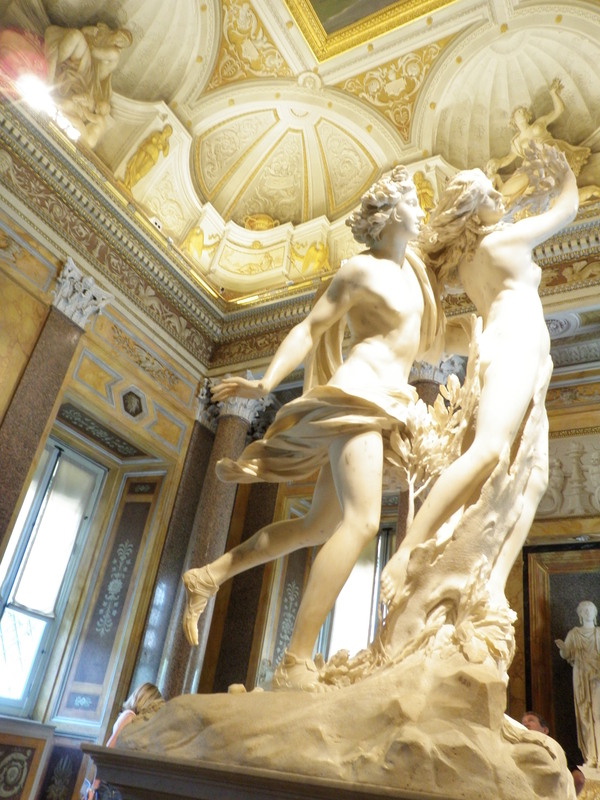 Hands down the most amazing things (for me at least) here are the collection of Bernini sculptures. This man was a true artist and my “stolen” photos, aka hip shots, do no justice to the beauty of these pieces. Every muscle, every expression, EVERY LITTLE THING is intricately perfect. Love, love, love. After, we met with Manuela Cuccuru at the Gagosian Gallery to view the exhibition, “Made in Italy.” There were some big name artists in the show including, Damien Hirst, if you remember my post about the Golden Dipped Cow. However, you all know me and modern art, our relationship is fairly non-existent. The meeting with Manuela was interesting however, learning about how they jury their shows and how they feel they are comparing to other galleries around Rome. 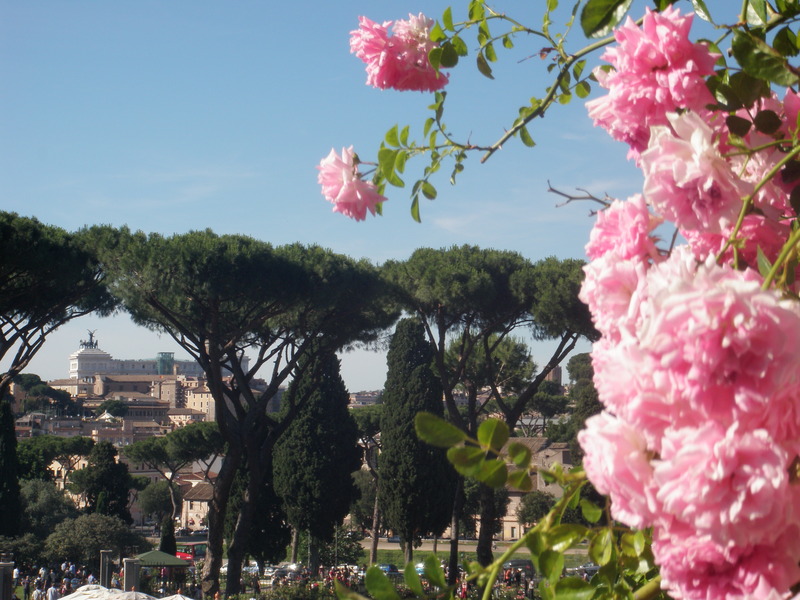 We spent a really long portion of our day at Borghese so we all sort of split ways at this point. 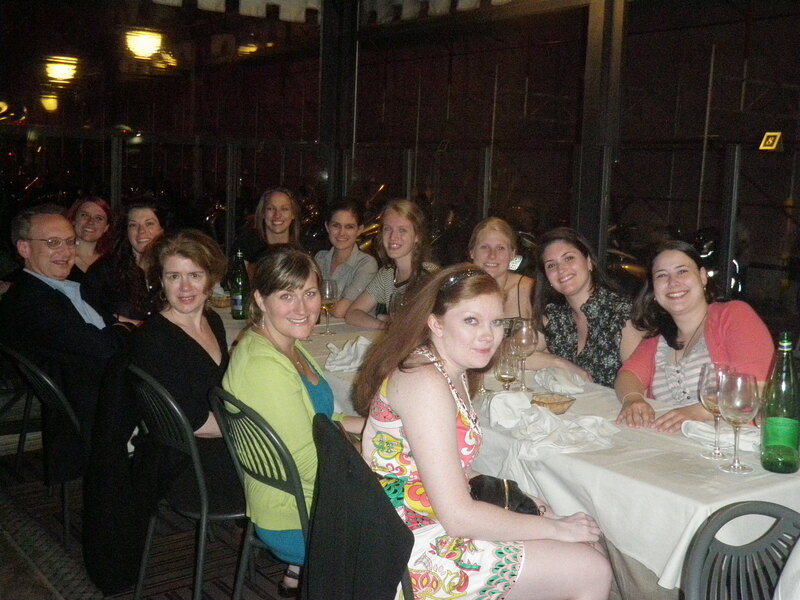 A small group of us travelled on over to the Cimeterio dei Cappuccini/Crypt of the Cappuchins. This is sort of one of those weird things you think only exist on the travel channel. It’s a little crypt under a church, Santa Maria della Concezione, built by the Cappuchin monks out of the dead exhumed from a cemetery, and later their own relatives and brothers. 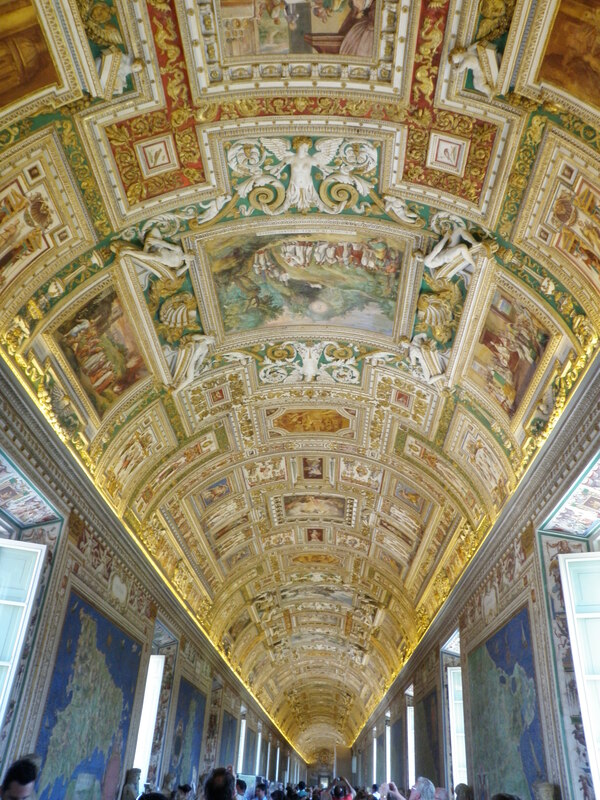 Thousands of bodies literally adorn the walls and ceilings in intricate mosaics of random bones. You have light fixtures made from spinal discs and walls stacked with skulls. 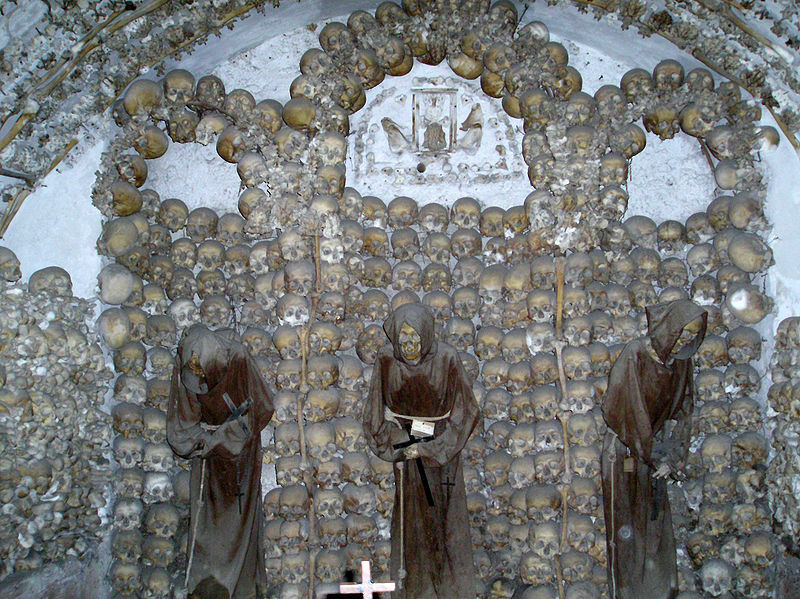 The bodies age from 1500 to the 1870s, though this particular crypt wasn’t in existence until 1631. The bodies aging older than that were ordered to be moved from another cemetery in Rome. Unlike most people I wasn’t unsettled by being surrounded by so many dead bodies, I was struck by the fact that people had spent hours below ground with rotted/rotting corpses creating ornate designs in bones and fastening them to walls. To each his own I suppose. Hello again friends! I was supposed to write about Rome while everything was fresh in my mind. You can see that that has happened. Work, school, moving into a new apartment and the manfriend have all sort of sucked up most of my spare time. 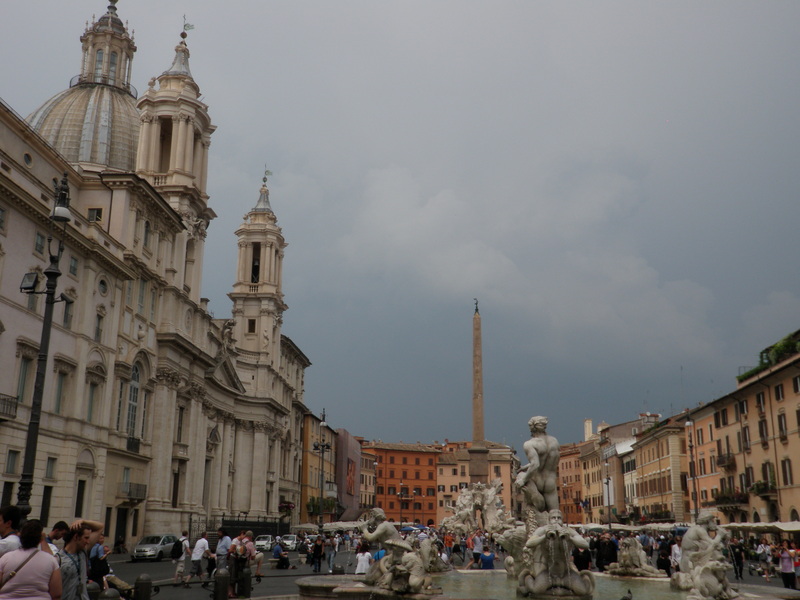 BUT, three weeks later, here is day two of Roma. Day two in Rome was simply out of control; so much amazing stuff and insane amounts of information to attempt to digest. Beginning in the 1660s young English and Northern European Aristocratic men would undertake a journey they referred to as The Grand Tour. The Grand Tour was the name given to the ideal way of obtaining one’s education: they would travel all through Europe, ending in Italy and on into Rome: soaking up the language, sport, art, manners and culture as they went in order to become a “properly” educated citizen of the world. This day felt like my grand tour and I feel like I did as much in a day that they did in several months to years. 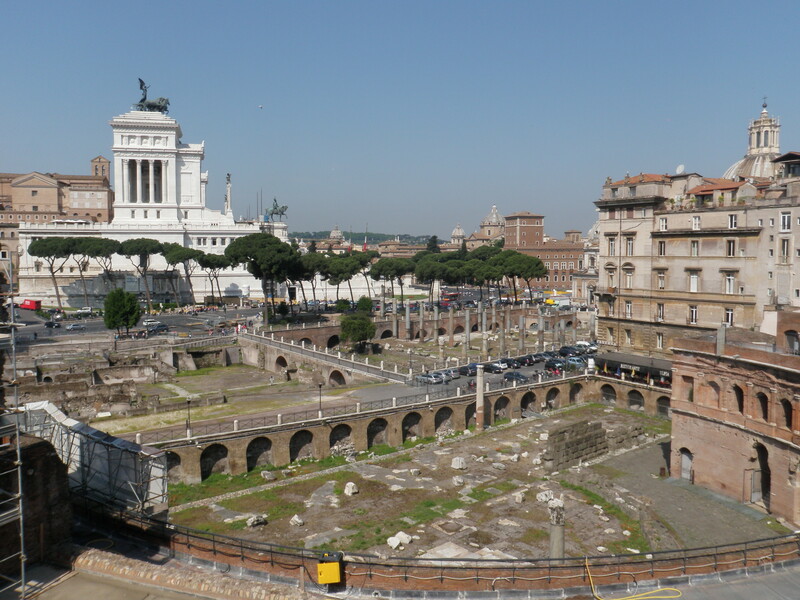 We began at the Markets of Trajan and the Museum di Imperiali. This location was basically the very first indoor shopping mall. A large portion of the structure has been turned into a museum. The really interesting thing is how well they have modified the space to be a working museum without imposing too far on the original material of the structure. The once open doorways and windows are covered in clear plexi-glass and ramps are built in but not permanent. By ethical standards of adaptive reuse in historic structures, no alterations should be made that are not reversible without harm to the building. From the top level of the market we got another excellent view of Rome and the Forum below. You could really see the effects of time on all the structures, including a part of the market structure where medieval dwellings had been built to create another floor of the already existing building. 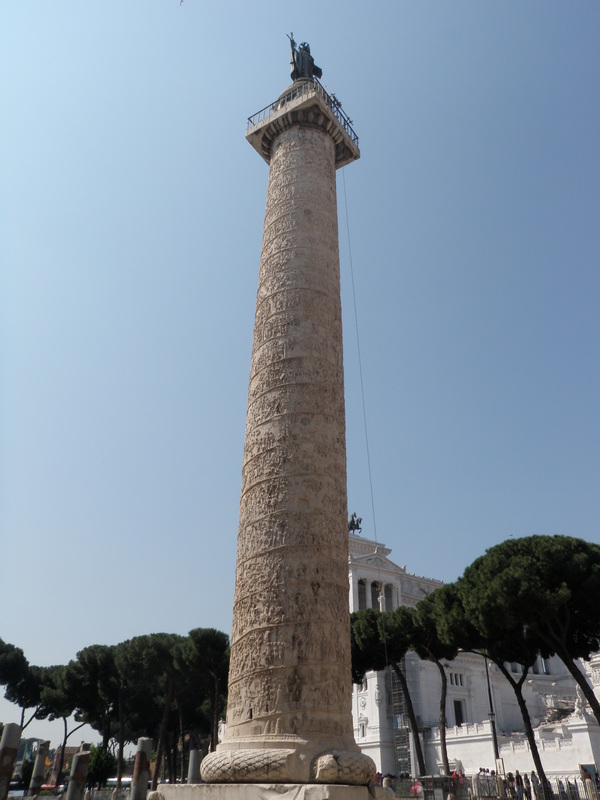 Next to the market is the Column of Trajan, spiraled with a beautifully detailed relief telling of the military history of Trajan. Makes you think, whatever happened to craftsmanship? So much effort used to go into everything and now we are blessed with things like tin-sided churches. 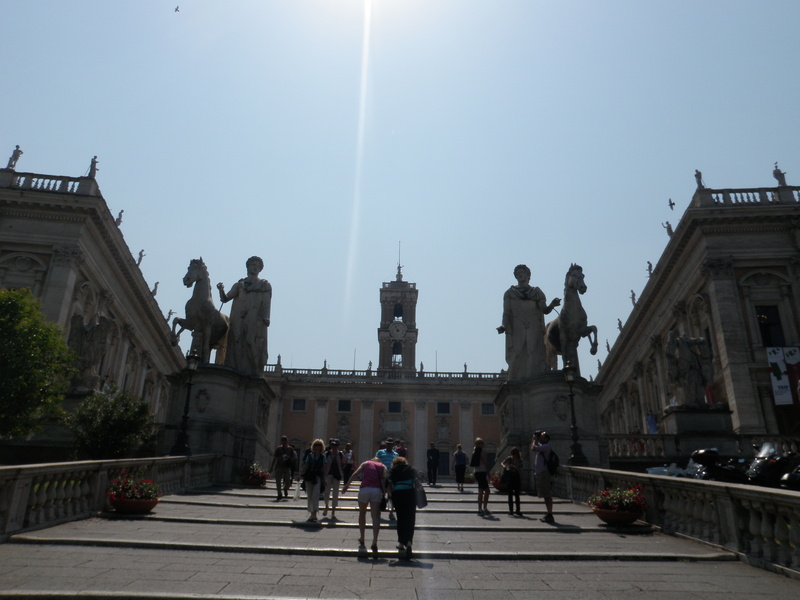 Greeted by two large horse statues, the protectors of the city, we visited Capitoline Hill which is known as the “city center”. Here you see a lot of Rome’s most renowned sculpture including the classic Julius Caeser on his horse, the over-sized head, hand and foot of Constantine, the she wolf suckling Romulus and Remus and many, many, many more. Much of this sculpture wasn’t moved to the Capitoline until the 1470’s when the Pope returned them to the city and its people from the papal collections. At this point the sculpture became one of the first really “public” collections in history. I’m not sure why it struck me so, but one piece I found oddly beautiful in the Musei Capitolini was of the satyr (you all know I LOVE satyrs!) 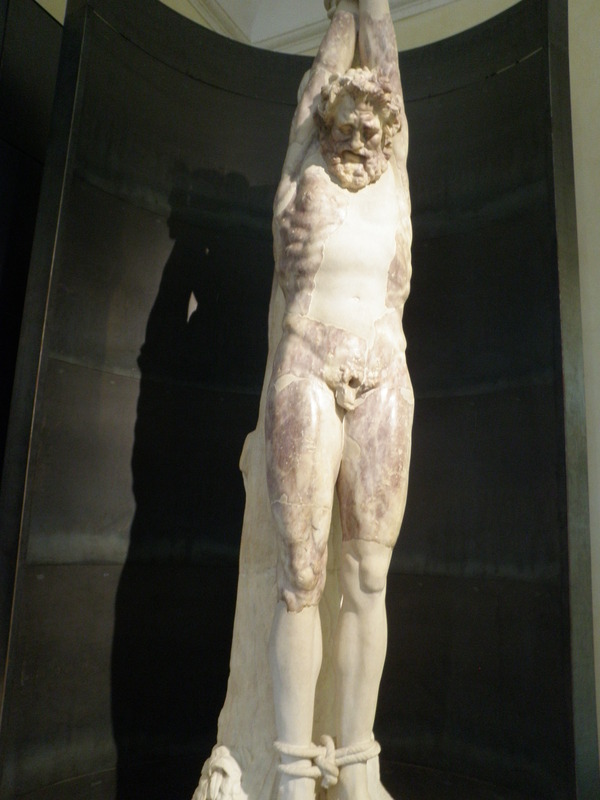 Marsyas. He made the awful mistake of challenging Apollo to a music competition and for that lost his hide and his life. This statue is carved from a deep purple veined marble which was to represent the many lashings he received for his folly. Though sad, the statue is very beautiful and moving in a way. Something I found throughout my entire time in Rome was the fact that in Rome it is IMPOSSIBLE to separate the old and the new, everything is all tossed together and built up next to each other. I. LOVE. IT. 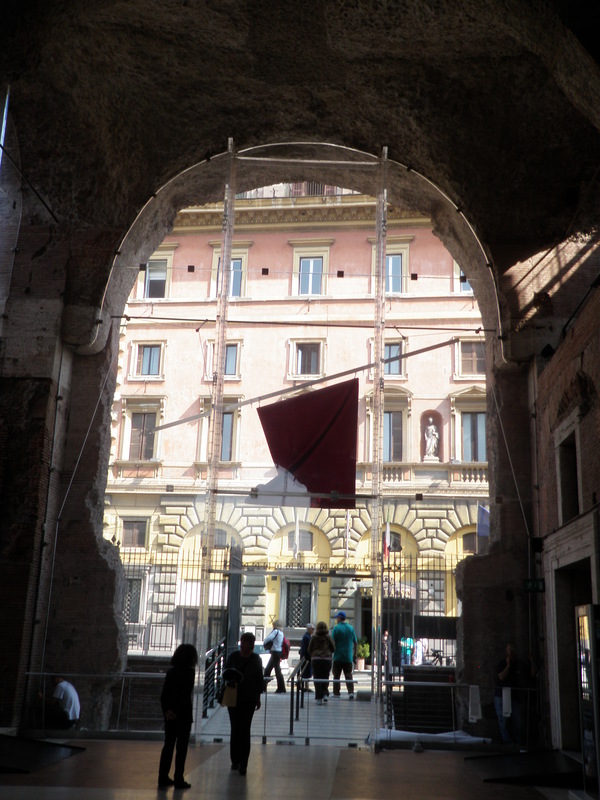 Rome touches on so many museum issues for me that I could write a million blog posts. Hopefully posts will come someday about reconstruction versus preservation and also more on the integration of the old and new in Roman museums and galleries. We did a ton of interesting stuff on day 2 but I can’t elaborate on everything or this would be as long as a guide book. Enjoy the photos of things we saw/did and I’ve added some external links in if you’d like to read more about something. Mattei Family Sculpture Garden, an extremely expensive display of self-wealth. 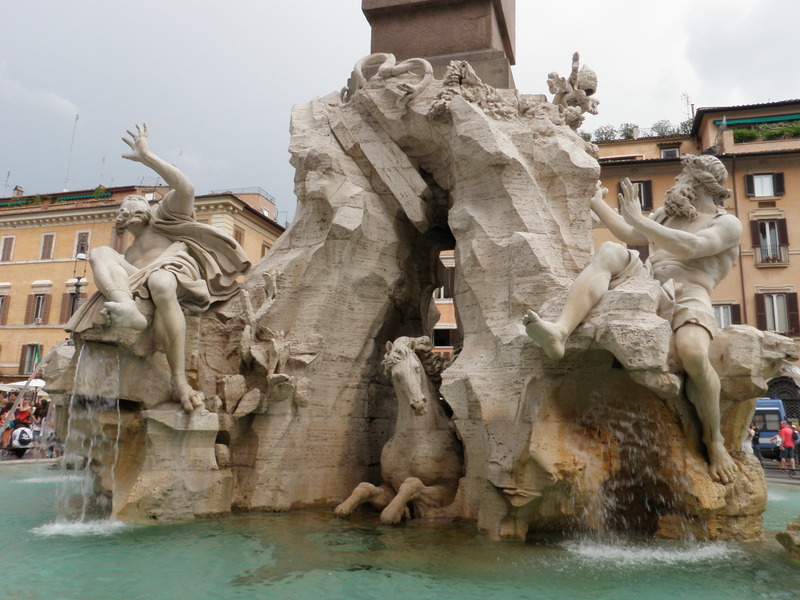 Piazza Navona includes some AMAZING Bernini fountains/sculptures, that guy was just fantastic at what he did. Here, this fountain represents the four rivers. We saw a LOT of churches whilst in Rome and not being my favorite bit I’m not going to elaborate on all of them though I might pop a few pictures in. We ended up at the Pantheon (Temple of the Gods). There is still much that is left unknown about this structure and its purposes which made it a little hard for me to get into, but it’s still one of those “must see” sites. After class hours we wandered off to the Forum, dinner and the Trevi Fountain. 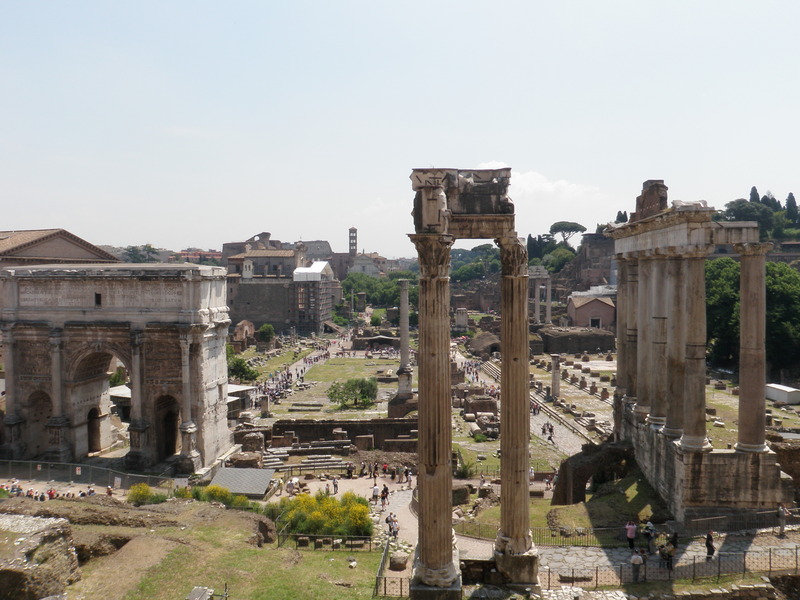 You could spend an entire day wandering around the Forum reading about all of the different structures that are there. 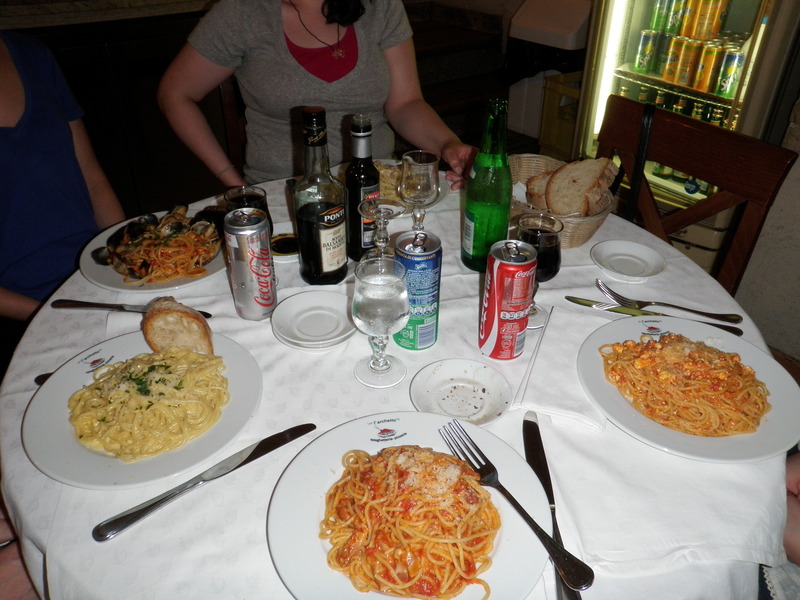 After, we ate at a L’Archetto, a macaroni joint that boasts more than 100 different sauces/gravies. It was delicious. 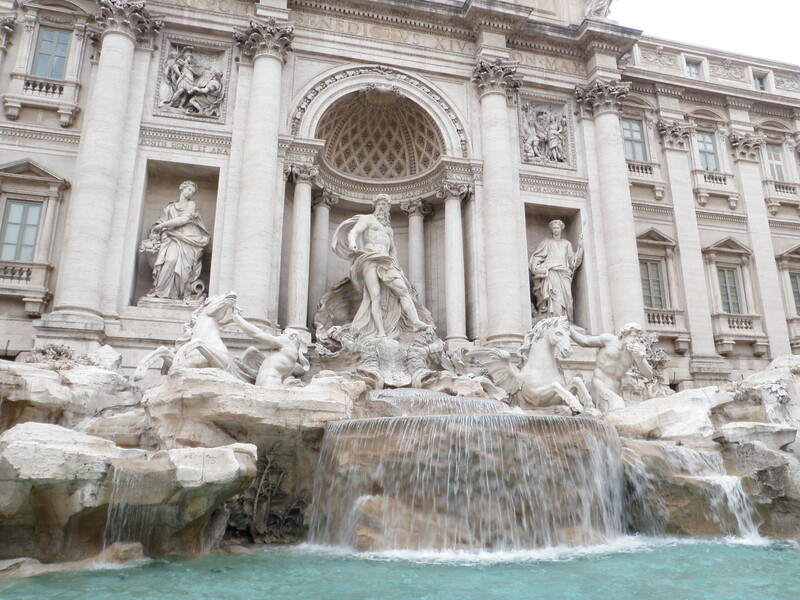 As for the Trevi Fountain it is enormous and beautiful and I loved it.